KEFAUVER, Carey Estes, a Representative and a Senator from Tennessee; born on a farm near Madisonville, Monroe County, Tenn., July 26, 1903; attended the public schools; graduated from the University of Tennessee at Knoxville in 1924 and from the law department of Yale University, New Haven, Conn., in 1927; admitted to the bar in 1926 and commenced practice in Chattanooga, Tenn., in 1927; unsuccessful candidate for the State senate in 1936; State commissioner of finance and taxation 1939; elected on September 13, 1939, as a Democrat to the Seventy-sixth Congress to fill the vacancy caused by the death of Sam D. McReynolds; reelected to the Seventy-seventh and to the three succeeding Congresses and served from September 13, 1939, to January 3, 1949; did not seek renomination in 1948; elected to the United States Senate as a Democrat in 1948; reelected in 1954, and again in 1960, and served from January 3, 1949, until his death in the naval hospital at Bethesda, Md., August 10, 1963; gained national attention as chairman of the Special Committee on Organized Crime in Interstate Commerce (Eighty-first and Eighty-second Congresses), better known as the Kefauver Committee; unsuccessful candidate for the Democratic presidential nomination in 1952 and 1956; unsuccessful Democratic nominee for vice president of the United States in 1956 on the ticket with Adlai Stevenson; interment in the family cemetery, Madisonville, Tenn.
American National Biography; Dictionary of American Biography; Fontenay, Charles. 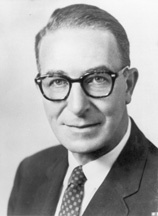 Estes Kefauver, A Biography. Knoxville: University of Tennessee Press, 1980; Moore, William Howard. The Kefauver Committee and the Politics of Crime, 1950-1952. Columbia: University of Missouri Press, 1974.